Aramid ia a manufactured fiber in which the fiber forming substance is a long-chain synthetic polyamide in which at least 85% of the amide (-CO-NH-) linkages are attached directly between two aromatic rings. 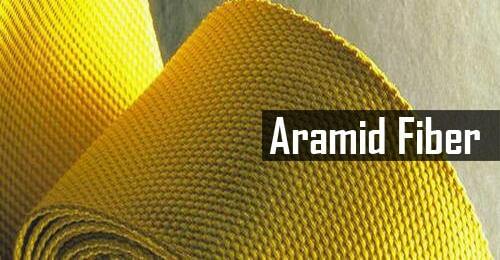 Technically, aramid fibers are long-chain synthetic polyamides. Aramid fibers have extremely high tensile strength, which is why they are commonly used in armor and ballistic protection applications. With a distinctive yellow color, aramid fibers are frequently used in advanced composite products which require high-strength and light-weight properties. Aromatic polyamides were first introduced in commercial applications in the early 1960s, with a meta-aramid fiber produced by DuPont under the tradename Nomex. Aramid fiber, which handles similarly to normal textile apparel fibers, is characterized by its excellent resistance to heat, as it neither melts nor ignites in normal levels of oxygen. Aramid is used extensively in the production of protective apparel, air filtration, thermal and electrical insulation as well as a substitute for asbestos. Meta-aramid is also produced in the Netherlands and Japan by Teijin under the tradename Teijinconex, in China by Yantai under the tradename New Star and a variant of meta-aramid in France by Kermel under the tradename Kermel. World capacity of para-aramid production is estimated at about 41,000 tons/yr in 2002 and increases each year by 5-10%. In 2007 this means a total production capacity of around 55,000 tons/yr. After production of the polymer, the aramid fiber is produced by spinning the solved polymer to a solid fiber from a liquid chemical blend. Polymer solvent for spinning PPTA is generally 100% (water free) sulfuric acid (H2SO4). Hockey sticks (normally in composition with such materials as wood and carbon).